Supergirl introduces another World Killer and deals with lingering relationship dynamics as it breaks for a long hiatus. Season long villains have a strong chance of running out of steam very quickly as has been proven in the other DC shows so steps have to be taken in order to make allowances for that. The approach taken here is to establish that Reign isn’t the only game in town and surround her with a small number of complex villains. Julia aka Purity (Krys Marshall) is a strong example of how to build an engaging villain in a very short space of time. The episode gets right to the meat of the story by beginning with Team Supergirl going to confront her. There’s a capable contrast between the foreboding setup and the actual confrontation. Julia is shocked and terrified that the DEO have shown up at her house for seemingly no reason and reacts as you might expect for someone who randomly has armed agents turn up at their home. It doesn’t take long for Purity to emerge and make quick work of the team who eventually get the upper hand thanks to a combination of Kara’s super breath and J’Onn’s Martian intangibility. Of course it can’t be as easy as capturing the villain in the opening minutes of the episode and calling it a day. Much of this episode is about the duality of Julia and Purity. Kara employs her usual tactic of appealing to the Human side of her opponents and takes a compassionate approach to dealing with her. It’s what we expect from her and is used really well here. I like the way she does everything she can to learn about Julia and figure out what means the most to her. For the most part it falls on deaf ears and Purity toys with Kara in really sadistic ways. She mentions things like playing the part of Julia implying that there is no Human side to reach. Naturally Kara doesn’t believe this because of what she finds out in her research. Ultimately it’s the mention of her best friend who she leapt in front of a car to save a couple of episodes ago that makes the Human side of her manifest if only for a moment. That’s all Kara needs to realise that the World Killers aren’t inherently evil and there is an internal conflict to be exploited. She makes the decision to attempt to save them rather than defeat them which sets up that appealing to their Humanity is how she will win. It’s nothing new but ties into one of the core themes of this show and allows Kara’s characterisation to maintain consistency without ever becoming stale. As she gains more experience she learns more about how better to protect people and is able to use the resources at her disposal to find smarter ways of achieving her goals. She does lose her faith at one point but it is brief and restored later by Alex. Her efforts ultimately prove to be worthwhile when the Julia personality asserts itself at a key moment in the final confrontation and sacrifices herself by giving over to Reign in order to protect those around her. The episode makes as clear a distinction between Purity and Julia as the show has with Reign and Sam which sets up a collection of villains with hidden complexities to be exploited in order to defeat them. Presumably the final as yet unseen World Killer will be the same. Alex takes a much more violent approach to dealing with Purity for reasons that aren’t adequately explained. She behaves massively out of character delivering merciless threats that don’t really come from anywhere. It’s such huge departure from who Alex is that Kara confronts her about it only to get a half baked explanation about being concerned for Kara’s well being. It eventually turns out that her grief over the end of her relationship with Maggie has progressed to the point of violence and impatience. This doesn’t really fly as an explanation and I’m surprised that a government organisation would tolerate someone letting their personal problems affect their work in such a way. J’Onn may be a patient and understanding boss/father figure but surely he would have some sort of professional limit. 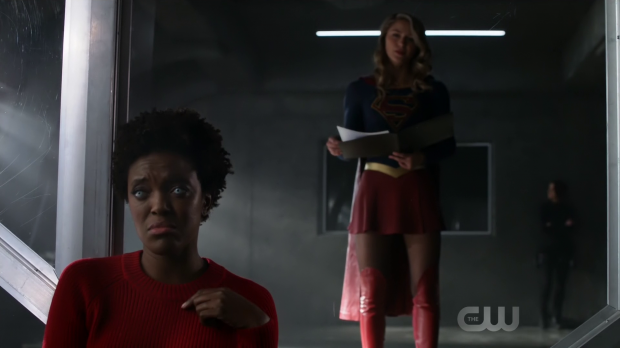 Despite this misstep the conversation between Alex and Kara towards the end of the episode is really well done and in keeping with some of the stronger sisterly bonding scenes this show has had. They both draw strength from each other in getting over their respective break-ups and Kara comes from a hopeful position as she is further along in her journey to normality than Alex is. It’s a far cry from her mindset earlier in the season and much more palatable to watch. The handling of Mon’El in this episode troubles me greatly because of what it appears to set up. What could have been a fun subplot where Mon’El, J’Onn and Winn work together to make the Legion ship operational again is tainted by the dreaded angst that so often plagues this show. 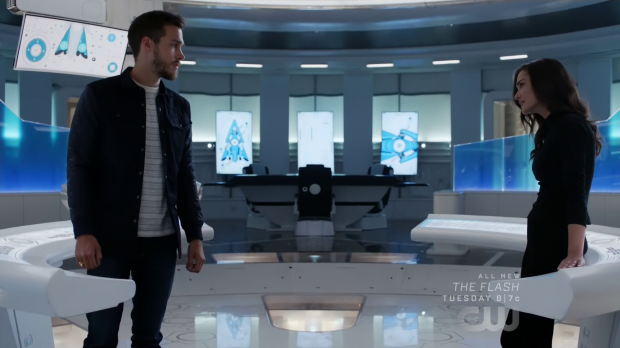 Mon’El’s cold interaction with Imra about an off screen argument they had starts things off and forces him to be introspective with J’Onn taken on the advisory role. 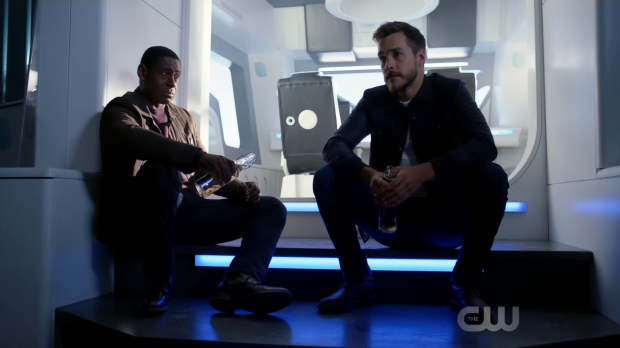 It isn’t a bad scene as J’Onn fits naturally into this role and it’s a good showcase of Mon’El’s newfound -from our perspective- maturity but it begins to open a can of worms around the love triangle I thought had been dealt with. It turns out that Mon’El’s feelings for Kara have been stirred up by being around her again and he’s struggling to deal with that unexpected development. The background of Mon’El and Imra’s politically inspired marriage is interesting enough but it uncomfortably sets the stage for Mon’El’s participation in it to be something he regrets. J’Onn advises him to be honest with Imra which he does and she reveals that she has been keeping her own secrets around the real reason for their presence in that time period. We don’t learn what that is so that’s left as a cliffhanger to be resolved when the show returns in April. This is all really problematic because this friction comes from nowhere. It certainly wasn’t present in any previous episode and the marital tension is in response to something we as the audience don’t even see. I felt as if I had missed a scene when Imra started talking about an argument that wasn’t featured in this or any prior episode. This all feels like clumsy setup for a Mon’El and Kara romance later in the season and it’s completely unnecessary at this point especially given how forced these scenes come across. Sam continue to reluctantly accept support from her friends when Lena grants her a day off to de-stress and spend it with Ruby. 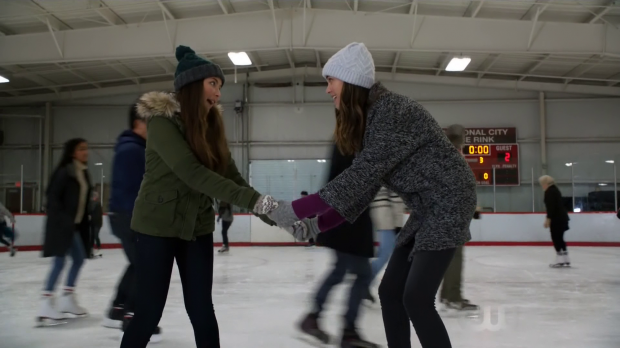 The Sam/Ruby relationship is always charming to watch and seeing them engage in a fairly mundane activity such as ice skating really does help create a sense of realism. They appear like a normal family who share in an activity which always helps ground the insanity of world killing aliens and super powers. The problem that manifests here is about as domestic as it gets. Ruby has to deal with being a child abandoned by her parent in a public place. She manages the situation by calling Lena to help her which allows for a really interesting scene where Lena points out that Ruby already knows something is wrong. Sam gets angry that Lena tells Ruby about her illness but all she did was confirm what was already known. The most interesting thing about this scene is that Lena appears to realise the truth. She notices that the blackouts and -presumably- Reign’s appearances coincide so assures Sam that she knows what’s wrong and how to fix it. Lena is every bit the supportive friend in this scene and I hope the realisation isn’t a red herring with some other far less interesting conclusion from Lena. I wonder if she will keep Sam’s dual identity a secret which might be frustrating but also the only real way to prolong the conflict between Reign and Kara into the latter part of the season. I’m not sure if there will be reasonable justification for more secrecy other than Sam asks for it but I’m still encouraged by the appearance of more complex villains. A solid episode that introduces a compelling new villain and sets up an interesting approach to help Kara defeat them. Brute strength won’t help Kara win as has been proven with Reign and now Purity because they are a good deal stronger than she is. The winning approach appears to be Kara’s innate goodness and ability to see that in others. Her appeal to Purity’s Humanity almost allows the Julia persona to win out with a satisfying payoff involving Julia giving herself to Reign in order to save lives. It looks like there will be a collection of complex villains after the hiatus and that’s no bad thing. Alex acts bizarrely out of character in this episode moving right to behaving aggressively all because she has reached a new stage in her relationship grief. It’s a flimsy justification for Alex and Kara to be on opposite sides and really doesn’t work though does result in a strong sisterly bonding scene. The handling of Mon’El in this episode is frustrating from an argument he’s having with Imra that began off screen to setting up that he still has feelings for Kara. I’m very much not interested in more love triangle angst and this is already a less than compelling example of it. Sam’s day out with Ruby is really charming to watch and the abandonment side of it is equally harrowing resulting in a really interesting scene where Lena seems to figure out the truth. Whether she actually has or not won’t be answered until April but hopefully it is what it appears to be. If you want to chat to me directly then I’m on Twitter as well. Join me back here in April for more Supergirl reviews.